You are here: Home / Great Deals / More Extreme Couponing? Well, TLC has decided to have 12 more episodes of Extreme Couponing. I wonder what they will do. I hate to see them make it a bad thing – I wish they would actually do something that would teach how to coupon shop instead of just the deals people can get and then not tell them how to do it. That could lead to a lot of people doing wrong things and getting frustrated and mad at stores which could be bad for us in the long run. Not sure what exactly it will mean for us! 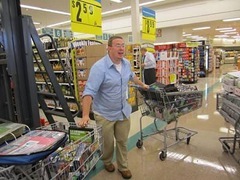 You can read more about the plans to add more Extreme Couponing episodes. What do y’all think? Did you like the first show – is there a series there or not? What would you like to see in a series like this? The first show was just a bunch of HOARDERS and not showcases HOW to coupon..yet only showcasing what a person got to be a HOARDER. If they plan to make it an series, I think they should show exactly HOW to coupon match, how to know WHEN is a good deal and how to buy what you need to stockpile and not be a HOARDER!!! Yes, I’m stuck on that word cause most of them were. Most were SELFISH and only 2 mention giving back and donating. I think its sad!! They need to go onto intervention not extreme couponing. Nobody will go through that much stuff. To them its a personal high. I am scared to see what is going to happen to the world of couponing and the changes that will be made by stores because of this program. What they should show is them donating the stuff not hoarding all of it. 1) the show is called Extreme Couponing for a reason. 2) it is, for all intents and purposes, part of the reality genre of television, which means it’s been edited to peek the most viewers’ interest, and thus be -well, extreme. Twelve more episodes? If they’re all like the first, no thanks. However, if they show segments like the second lady from Philly (forgive me, I forgot her name), who was TEACHING others while she shopped, or showed Joanne (The Krazy Coupon Lady) making donations -which I know she does!- it might be worthwhile. The fact that there’s an entire army of blogs out there dedicated to coupling (mine and this one included) should speak volumes tothe need and interest for a show about couponing. I agree, however, that episodes showing how one pulls theirdeals together, perhaps highlightingvarious organizational styles and “plans of attack” might be appealing to couponers, or to those wishing to join the Coupon Crusade. P.S. Please pardon any typos! My iPhone won’t allow me to scroll up and proofread! Argh!! I have known women who come out of the store paying virtually nothing but having an entire cart load of groceries. How do they do it? I am on this site in hopes that I can learn how to lower my grocery bill and help with my tight family budget. I do the Kroger coupons to my Kroger card then also find coupons on line to down load and print, but I have never been able to get my weeks worth of groceries almost absolutely free. I wish I could have seen this show. @Maureen Plumb: Welcome to my site! You can check out my eBook and videos to help you learn more bout couponing! And I am here to answer any questions you might have, just feel free to ask!